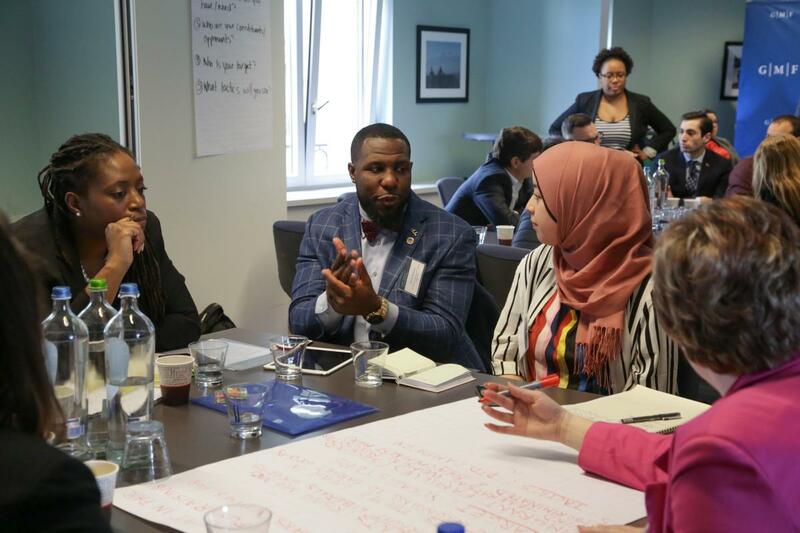 With a backdrop of rapid demographic change, the Transatlantic Inclusion Leaders Network (TILN) advances leaders who are global in outlook, representative, culturally competent, and inclusive. As a premier venue for young, diverse U.S. and European elected and civil society leaders to meet, the TILN workshop operates in tandem with the Young Professionals Summit at GMF’s Brussels Forum. At the workshop, TILN leaders are introduced to top policymakers and enter a dynamic network empowered with the skills, confidence, and connections to engage in service at higher levels of responsibility. With close to 200 TILN alumni, TILN workshops have created an empowered and highly upwardly mobile network of diverse young leaders that bridges the Atlantic and strengthens transatlantic relations for the future. "The most impactful thing about TILN is realizing that discrimination looks different but does exist in every country. If we all can come together with this common problem, we can help fight against it." "This has been an opportunity to reflect and remember that there are so many good people right across the world who are all working collectively, both together but also individually, to make the world a better place." "I work for civil society organizations, mainly LGBT organizations in Ukraine. For me it is important to increase my network, especially with people in Europe and the United States. I am striving to inspire LGBT people to be more active, to be subject of social political processes in Ukraine. I have gained many new insights and knowledge from TILN. This is very intense and interesting environment, with different people, different views, and different experiences. It is something that will move me forward – to take the steps that I did not dare to do before." "This was a great experience for all of us as participants to have a chance to be included in such a diverse group. What I really liked learning about was that we learned about each other’s experiences in a diverse society, which is invaluable because we can relate to a lot of other people’s problems and examples. We can come up with joint solutions. The energy of all these people together really showcases that we want to develop something new. Every day we were able to hear new solutions to our common problems. I think being in Brussels in this time in history when a lot of political events are unfolding in Europe and across the world, it is important to see what the EU response is to these challenges, and whether the future the EU will be successful in responding to these challenges it is facing." "I appreciate that I was able to work with people from such diverse communities and environments. We are all interested in public service, which means I share a sense of equality and desire to promote diversity in our workplaces. We may all have different government systems, different legislations, different constitutions, but we share the same problems. I know I can count on this network to give me a hand when I need it. The professional help I’ve gotten from advisor meetings and media work will help me in the future." "Meeting people from so many different backgrounds, countries, and languages really broadened my horizons. This sort of exposure is important to help push forward tolerance and being respectful to one another, which is an important first step if you want to make sure human rights and tolerance are a part of society. We all have the same aim to make the world a better place — a safer place for everyone. This is what we need: to talk to one another, to learn from one another." "I appreciate the connections that I have made with people, and the understanding of situations in other countries. Often the media focuses a lot on issues in the U.K, where I am from. It occurs to me now that we all have very similar issues in our own countries. This has been empowering. I am a leader and an agent of change, but I don’t always have the opportunity to mix with professional leaders and to learn from them about their experiences. Now that we are connected, we are able to work together to create change across the world and not just in our own localities." "Meeting people from all the other countries has been the most impactful part of TILN. Sometimes in America we work in silos, and we don’t always pay attention to what is going on in the world. We sometimes think that what is going on in our country is the only thing that matters. But I have been thoroughly impressed with the depth of the issues that everyone is working on and how hard they are working to change the things in their country — also with how similar a lot of our problems are."